Pumpkin is widely reckoned as a super food, rich in nutrients, high in fiber and low in calories. The best part, for me, is its beautiful sweet taste. Apart from making creamy pumpkin soup, I often cook various savoury or sweet dishes with this super food. 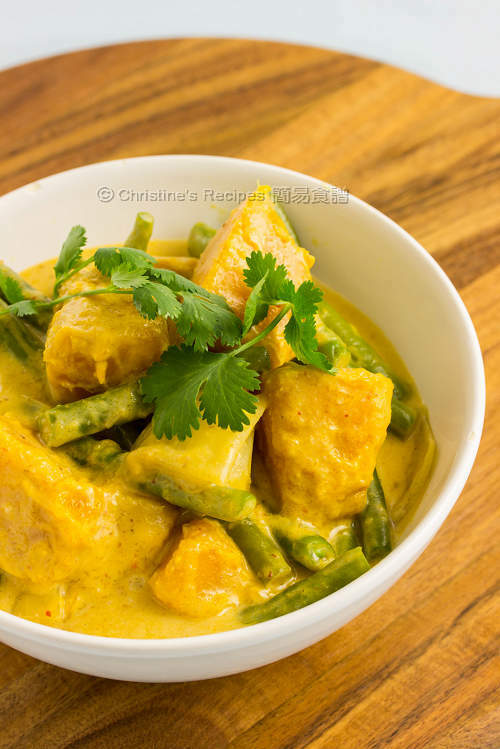 This pumpkin red curry dish that I made the other day, became a hit in the family. Although no meat was added, the taste was very good. It perfectly goes well with a bowl of steamed rice. Heat oil in a wok over medium heat. Saute minced garlic and red curry paste until aromatic. Pour chicken stock and coconut cream. Stir to combine. When it boils, add the pumpkin. Reduce the heat to low when it boils again. Simmer for about 10 minutes. Increase the heat to medium-high. 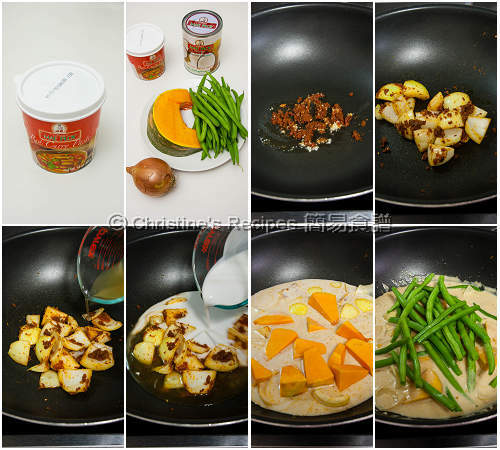 Add the green beans and cook until softened a bit, yet retain crunchiness. Stir in the seasonings. Season with salt. Try the taste. It’s done if you’re satisfied. Dish up and garnish with coriander. Serve hot. Palm sugar helps add a unique flavour to the curry. Both palm sugar and red curry paste are available at available at Asian grocery. You might adjust the amount of lemon juice according to your preference. Or use lime juice instead. A simple and deletable veggie curry, Christine. I love to make extra sauce with my bread. Thanks for yr recipe. 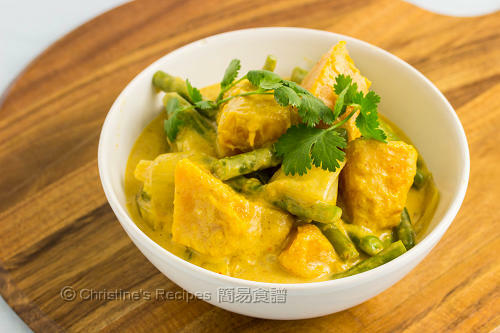 I love pumpkin.with curry it must be very nice.will try. re yr baked cha siu bao, the ingred is measured in cup. pls confirm how many gm is per cup.thanks for yr reply. I love yr recipes. They r easy to understand. Oh the recipe of cha siu bao was very old, posted a few years ago. Marked it down. If I do it again, will update it with gram measurement.